Zaino have also added Ultra-Gard™ for total protection from the sun, and our exclusive real leather oil concentrate for a rich leather scent. After just one use, your car will have that great new leather smell again. 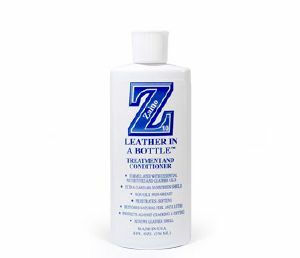 Z-10 Leather in a Bottle™ leaves a non-sticky, greaseless, stain repelling, natural luster and restores the supple feel and smell of new leather. Does a great job on vinyl interiors and dashboards too. We believe this product has no equal in the world.